From the Blackpool Magic Convention Facebook page.. 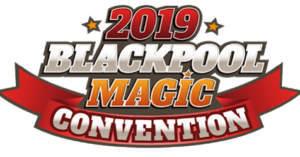 The convention has expanded and morphed into an event that no-one could have possibly imagined only a few years ago and it’s all thanks to you! This year we’ve booked more acts and shows than ever before, expanding the fringe event with a series of one-man shows, including the UK Convention debut of Amazing Johnathan. A show that will be a very special one-off performance on the Saturday Night in The Spanish Hall. Yet again, we’ve invested heavily in the technical aspect of the whole event, with upgraded video and lighting systems in all of the lecture theatres and rooms. The tech that we’re installing in The Opera House is bigger and better than ever before and we’re sure this will make the shows an even more spectacular and fun experience. If you haven’t already registered, check out who we’ve booked and see just what you’re missing. The shows in the Opera House Theatre, will feature some of the most outstanding talent in the world of magic. We’ve booked both of the current FISM World Champions to appear on the gala shows over the weekend. Both Miguel Munoz and Eric Chien will blow your minds with their unique and creative acts (Eric Chien will also be lecturing for the first time in the UK). Hans Klok, Eric Chien, Colin Cloud, Matt Edwards, Charlie Frye & Co, Patrick Lenahan, Lee Thompson, Michael Szanyieni, Derek Scott, Winston Fuenmayor, Mandy Muden, Rudy Coby, Tom Noddy, Hector Mancha, Issy Simpson, Miguel Munoz, Kris Kremo, Fielding West, Marc Spelmann, Paul Zerdin and Jack Beavis. Amazing Jonathan – Las Vegas Comedy legend Johnathan, will perform his hilarious stand-up show that has taken him around the world. This will be on Saturday Night in The Spanish Hall and seating is on a first come – first served basis. Paul Zerdin – Winner of America’s Got Talent, Paul will show just why he’s one of the very best in the world at what he does. The show debuts on Friday Night in The Pavillion Theatre. Paul Zenon – Back by popular demand. Paul will perform his brilliant and touching “Linking Rings” Show in The Pavilion on the Saturday Night. Nick Diffatte – Nick is a headliner from Las Vegas and will perform 2 comedy shows on Sunday Night in The Pavillion Theatre. This is someone that you won’t want to miss! We’ve lined up more lectures and talks than ever before and included in this are a series of “Ted’ style talks featuring some of the most successful young magicians in the world. The talks will cover TV Magic, Stage Illusions, Street Magic, TV Consultancy and Social Media. Add to this our ever popular Children’s Lectures and Children’s Entertainer of the Year Competition and we think you’ll agree that there’s something for everyone.